Welcome to third part of STM32duino tutorial. What do you expect? 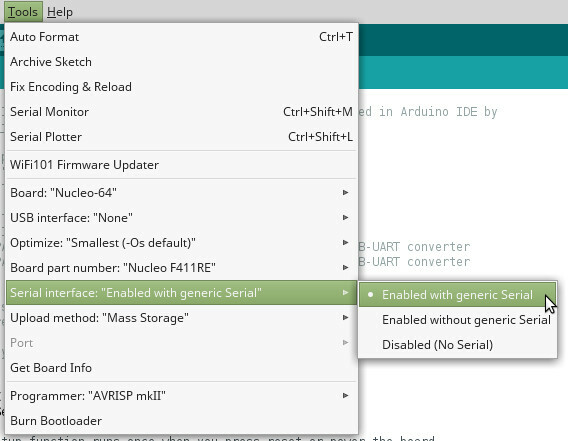 We check the most popular microcontroller interface - USART, called Serial in Arduino IDE. The STM32 microcontrollers includes a few USART buses. The feature of STM32 is possibility to change of USART connection. The USART bus is belongs to most popular microcontroller interface on the world. The bus is so easy. 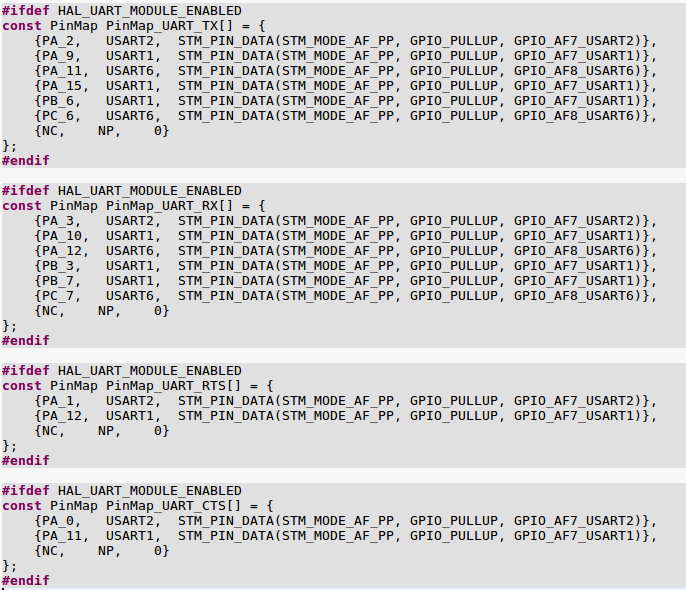 As I mentioned above, the STM32 microcontrollers includes more USART (Serial) buses. You can use all USART if there will not be a collision with USART connections. Big feaure is alternative connection of bus. You can easily change the pinout of USART to different GPIO instead of default pinout. There can be more alternative connection. This document is important for our development. . The names of buses you find on "HardwareSerial.cpp". 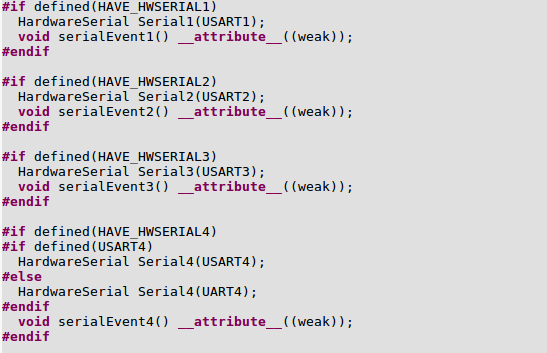 The default name of Serial is USART2 if you will not define differently. The alternative connection of buses you find on "PeripheralPins.c". This is printscreen of my Nucleo-64 board. After the installation of Arduino IDE with STM32duino support, you will see a new item, Serial Interface, in Arduino IDE. The default USART bus, Serial, is ordinarily used for programming of microcontroller and also for communication with laptop through Serial monitor (or other). 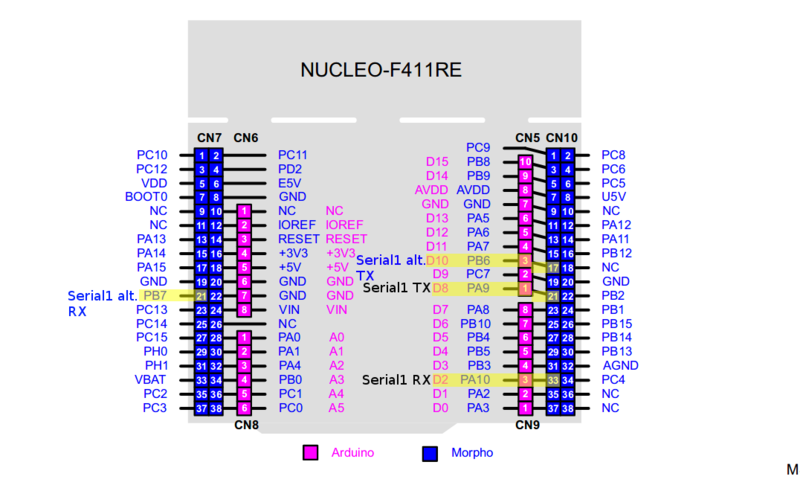 STM32 Nucleo-64 are programmed by STLINK/V2-1 programmer/debugger which is includes in Nucleo-64 board. The default setting of Nucleo-64 is this: output of Serial is directly connected to STLINK programmer. The STLINK is also used like USB-UART converter. The output of Serial bus is not directly connected to GPIO (D1/TX and D0/RX), but it is connected to STLINK programmer. This connection (between STM32 and STLINK) is also conneted to CN3 connector which is available on programmator board. If you want to connect Serial to D1/TX and D0/RX, you have to change of solder bridges. Solder SMD solder bridges SB62 and SB63 on bottom side of board. It will be physicaly connected to D0 a D1. You should disconnet the connection to STLINK - unsolder SB13 and SB14 SMD solder bridges. To avoid collision. Using of Serial is below. The default pinout of Serial1 is TX - PA9 ( Arduino D8) and RX - PA10 (Arduino D2). The example of using of Serial1. The important line of the code is HardwareSerial Serial1(rx, tx); which declare Rx and Tx pins. The example with alternative pinout of Serial1 (TX - PB6, RX - PB7, both on Morpho connector). 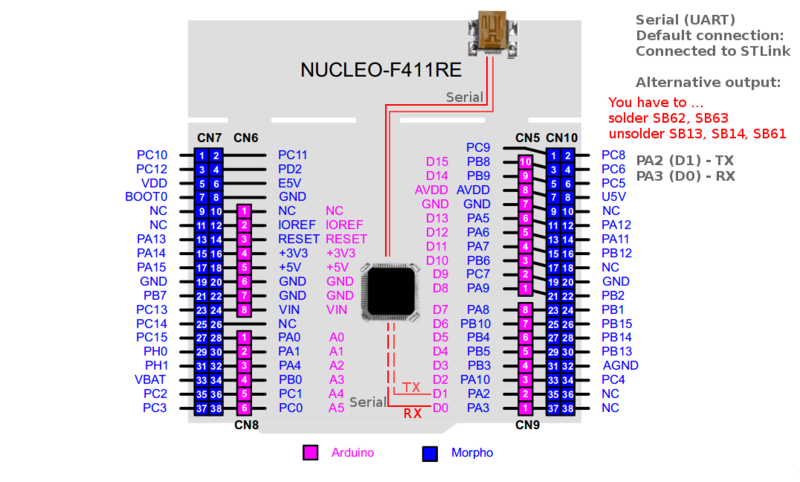 If you have microcontroller which contains more USARTs, you can use it. For example: Serial6. Example with using of default pinout of Serial6. The important line of the code is HardwareSerial Serial6(rx, tx); which declare Rx and Tx pins. The example of using of alternative pinout of Serial6 (TX - PC6, RX - PC7). And that's all. If you like this tutorial how to use STM32duino, share it with #STM32duino hashtag.